Co-hosted by the E.A.R.T.H. Lab and the UCSC Farm & Garden and the Center for Agroecology & Sustainable Food Systems (CASFS). 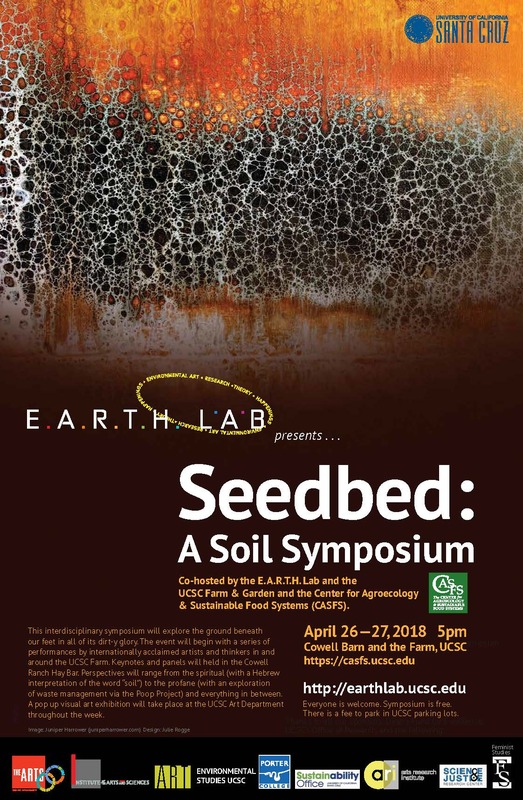 This interdisciplinary symposium will explore the ground beneath our feet in all of its dirt-y glory. The event will begin with a series of performances by internationally acclaimed artists and thinkers in and around the UCSC Farm. Keynotes and panels will held in the Cowell Ranch Hay Bar. Perspectives will range from the spiritual (with a Hebrew interpretation of the word “soil”) to the profane (with an exploration of waste management via the Poop Project) and everything in between. A pop up visual art exhibition will take place at the UCSC Art Department throughout the week. Everyone is welcome. Symposium is free. There is a fee to park in UCSC parking lots. Thanks to all our sponsors: Dean’s Fund for Excellence, UCSC’s Office of Research, Feminist Studies, Environmental studies, Sustainability office, Arts Research Institute, Science and Justice, Porter College.